Key Token Signalling for the 21st century by Tern Systems Ltd.
Key Token Signalling for the 21st Century. Now offering compact, solenoid-controlled trapped-key mechanisms for use with networked safety critical devices - and not just in the railway industry either! Ternkey is a completely new way of using key tokens as train operating authorities and is poles apart from traditional heritage systems and methods of working. Using 21st century technology, it prompts a re-assessment of key tokens in the modern railway environment. 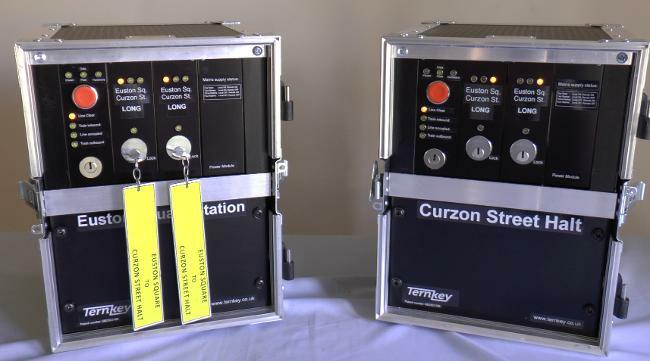 Designed to give an unprecedented level of operating flexibility and efficiency, the system can remotely control a railway with up to five passing loops and does not require lineside cabling. Ternkey can accommodate long and short section working, engineers' possessions, banking engines and most other defined operating variations. It can even safely shorten an authority 'on the fly'. Most importantly, there is no electronic equipment on a loco or any part of the train. The key token machines are manufactured using commercially available components. They are mass produced and standardized and so don't rely on the availability of any sort of second-hand heritage kit. There's no need to scratch around finding something that has to be butchered for it to work. Being entirely modular, all components can be changed without in-depth technical knowledge. The equipment can be entirely portable and can be taken back into store when the railway is not in use. It was originally developed for minor railways. The design of the various modules has been perfected and tested over the years and so it could have uses in other applications such as temporary signalling systems or the control of engineers’ trains in long possessions. An early version formed the first part of a scheme to increase line capacity and operating flexibility on the Isle of Man steam railway system. Successfully commissioned during the summer of 2016, it is featured in the Press Cutting on the next page. A new, simpler, 'headless' version for very basic railways or other applications is now available and is shown in the photograph above and on the video as below. If you're interested, then just drop me a line and I'll see what I can do to fix up a viewing. If you're after something really uncomplicated, then this could fit the bill. Latest developments: The locks that hold the key tokens have been redesigned to be more compact giving the whole Ternkey unit a much smaller - and lighter - footprint. The new versions have survived endurance testing and are now available separately for general industrial use. The basic lock chassis is much more compact than other solenoid-controlled locks on the market. These are simple bespoke devices readily adaptable to customers requirements. Contact us for details of fixings, voltages etc.